The Aprilaire 1770A dehumidifier is the most powerful of three whole home models in the range. With a moisture extraction capacity of 135 pints per day the 1770A can control humidity throughout a home of up to 2900 square feet. If your moisture problem is confined to a single room of your home, the basement for example, there are other options you may wish to consider. If high summer humidity is causing discomfort and encouraging mold in all areas however a whole home unit offers several advantages. Only one appliance is needed, rather than a number of individual units. It is a part of your HVAC system, working with it to add precise moisture control to the cooling and heating systems already in place. It is located alongside your air-con unit or furnace in a location convenient for you and your family and where any noise nuisance will be least intrusive. It is more energy efficient than multiple portable units and will last longer. 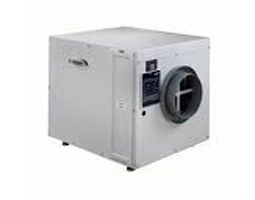 The Aprilaire 1770A dehumidifier is one among several models from which you might choose. Its main advantages are the flexibility it offers through its three dehumidifying modes and a fresh air ventilation option together with its low noise output. Its biggest disadvantage is that it is not Energy Star qualified, unlike its major competitors. Consumer reviews of the Aprilaire 1770A dehumidifier are fairly scarce but those that are available are positive. It is a competent appliance and if its particular advantages are important to you I would have no reason to steer you away from this model. The Aprilaire 1770A dehumidifier is well suited to its purpose as a whole home unit. In common with most whole home dehumidifiers it can be operated in free-standing mode and could be considered for use in a basement where it would be very effective. Users who have written reviews are generally pleased with the 1770A and find it effective, fairly quiet and reliable. The limited number of such reviews makes it difficult to draw definite conclusions about this model but there are no indications of serious flaws or failures which should deter prospective buyers. My overall assessment is that the Aprilaire 1770A dehumidifier is an effective, soundly built and, as far as the evidence shows, reliable model. I have neither any reason to recommend it in preference to its main rivals nor any cause to advise you against purchasing it. Your decision will depend upon your particular priorities. If the features of the 1770A suit your needs more precisely than models offered by other manufacturers I feel sure that you will be more than satisfied with it. If you are more concerned about other characteristics you may be drawn to choose an alternative. Should your first priority be energy efficiency, for example, it might be wiser to look at Honeywell or Ultra-Aire products before considering the 1770A. My view on using the Aprilaire 1770A dehumidifier as a basement unit is more straightforward. It offers no advantage over a basement model from a reputable manufacturer and is less energy efficient so a basement unit is the better choice.